My mother’s grandparents came through Ellis Island, on their way from what was then Czechoslovakia, headed towards a small farm town in Indiana. I don’t know why they left their home in Bohemia, or what led them to the Midwest. I don’t know what they did before they arrived there. But as culture and language stick together, my grandpa and grandma made a Czech partnership, and used their common language to keep secrets from their five kids. They are now both deceased for many years. I always thought they were sort of strange. Even though my grandma was nice to me and fed me too many sweets and took my sister and I to the park, I had nightmares that she was abusive (which she actually was to her own children, but I didn’t know that yet). My grandpa never talked much. He just smoked his pipe and played cards and carved nifty wooden sculptures. When he did talk, his voice was muffled and deep; in my memory it sounds like an obstructed baritone whistle. 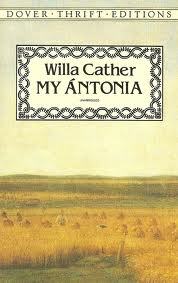 I just finished reading My Antonia by Willa Cather. I didn’t realize that the entire subject of the book would be about people just like my Bohemian immigrant ancestors. I’d never thought about what they must have gone through in their first years on fresh land. The fact that I balked when my grandpa said that as a child he had to use an outhouse in the freezing cold must have given me some inclination of the difficult upbringing he had, and the struggles they endured on the farm. “How ya gonna keep ’em down on the farm, after they’ve seen Paree?” That’s pretty much what happened with Grandpa after he returned from World War II. He didn’t make the final cut to play for the White Sox, so he became a furniture builder, and ditched the farm for good. Kolaches. I’ve eaten them all of my life, but I never knew how they were spelled. It seemed like a revelation to first see that word on the page in Willa Cather’s book. A small round fluffy pastry cookie topped with jam and sprinkled with powdered sugar. My mom makes kolaches better than anyone, and my favorite flavor is apricot. I don’t know how to make kolaches. Neither do I know her recipe for bread dumplings and pork roast with caraway seeds. Or even hoska – that braided egg bread with maraschino cherries tucked in the crevices. I don’t have any of these traditions, and when my mother is gone, they’ll be lost unless I do something about it. Food is all I have left of that culture. In the book, Antonia has a special spirit that stays with the narrator all of his life, haunting him, though he leaves Nebraska and becomes a lawyer on the East Coast. Some of the other European women that he grew up with go on to find success and independence. But Antonia does not. Antonia has a vitality that never leaves her and a fierce courage to never give up on the difficulties of farming, even though her husband would rather live in the city. Thanks to the orchard skills he picked up in Florida, though, they have the best fruit trees around. My life began in a crab apple tree in a suburb outside of Chicago. It cradled me. I spent long periods of time in its knots and branches. Eventually, I perched up so high that none of the boys running around the neighborhood could see that I was watching them. My mother hated that tree. The driveway was light grey cement, and the crab apples left pinkish brown stains after they fell. Up in the branches, my sister dared me to eat a crab apple. It was very sour and left a waxy texture on my teeth. I wondered what anyone would use them for. Since we left that house and moved to Seattle, I haven’t seen a crab apple tree since. It only exists in that pure time of life that I can barely remember, that time where my grandmother was still alive. She died three months before we moved. All of the events that occurred that year marked the end of my innocence. That’s a story I’ve told before. Willa Cather reminded me of all of this. She gave me pride in how strong those immigrant women of the Midwest were. They didn’t live by anyone else’s standards. They became warriors of survival, and if necessary, ditched the dress to plow the fields. There was no complacency, or settling for someone else’s will. My mother’s family story had seemed pretty boring to me before. Not now. Next Sunday night, at family dinner, I’m going to ask for my mother’s recipes, that were her mother’s recipes, and so on and so forth. I wonder just how far back those kitchen secrets go. I’m going to ask more questions. And one of these years, I’ll take a trip to Prague. My mother loves it there. Wow, I really enjoyed reading “My Antonia” and I’m not Bohemian. Your experience reading the book must have been very special. Thanks for sharing! Hey Lauren, it’s Bill! Nice to read your post, you’re definitely fulfilling your grandmother’s passion for writing. Your mentioning the hard life of the Bohemian farm women in the midwest reminds me of your grandmother’s story about working the wheat thresher for her father. Such a different life. All I know about her parents from Bohemian times is that her father Rudolph owned a brewery somewhere in Bohemia. The license (in Czech) is somewhere in a box of family papers. Don’t know why they immigrated to the US either, and why Rudy didn’t continue brewing over here. Went straight to farming. Hi Bill! For everyone out there, Bill is my uncle, and my mother’s youngest brother. Yes, I wish we had more of the story of why they came to the U.S. Mom seemed to remember that Rudolph was a bartender, but owning a brewery sounds like a pretty great life! It seems that a lot of people at that time were mesmerized by the dream of coming to America (still are), but didn’t realize just how difficult it would be when they got here. You are currently reading Finding My Bohemia at Lauren J. Barnhart.